Biblioasis is a Canadian-based independent literary press and book store. Biblioasis was founded and based in Windsor, Ontario. Biblioasis was founded by the Chatham, Ontario born Dan Wells. It opened as a book store in July, 1998, located at 519 Ouellette Avenue. This location would close in 2007. In the early 2000’s Biblioasis began its career as a publishing house. Dennis Priebe would serve as the publisher’s Production Manager until 2013. Biblioasis’s first book was published in 2004, a collection of poems called Straight Razor by Windsor poet Salvatore Ala. In 2004 the critic and author John Metcalf worked for Biblioasis as the Fiction Editor. Wells partnered with University of Guelph professor and author Stephen Henighan to establish the Biblioasis International Translation Series in 2007. In 2010 a Biblioasis published book, Light Lifting by Alexander MacLeod, was nominated was the Scotiabank Giller Prize short-list. 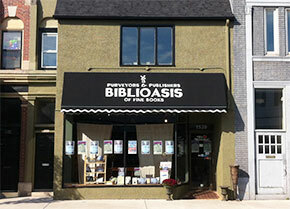 In 2012, Biblioasis opened a new bookstore in Windsor’s Walkerville neighbourhood, at 1520 Wyandotte Street East. Biblioasis launched a subsidiary called ReSet Books in 2014. In 2015 three Biblioasis publications were selected for the Scotiabank Giller Prize long-list: Arvida by Samuel Archibald, and Martin John by Anakana Schofield were selected for the Giller Prize short-list. Biblioasis.com. Web. Accessed Feb. 13, 2018. Biblioasistranslation.com. Web. Accessed Feb. 13, 2018. “Biblioasis celebrates 10 years of publishing.” Windsor Star. Sept. 11, 2014. Web. Accessed Feb. 13, 2018. Robins, Geoff. “Biblioasis is no mirage.” The Globe and Mail. Mar. 25, 2017. Web. Accessed Feb. 13, 2018.